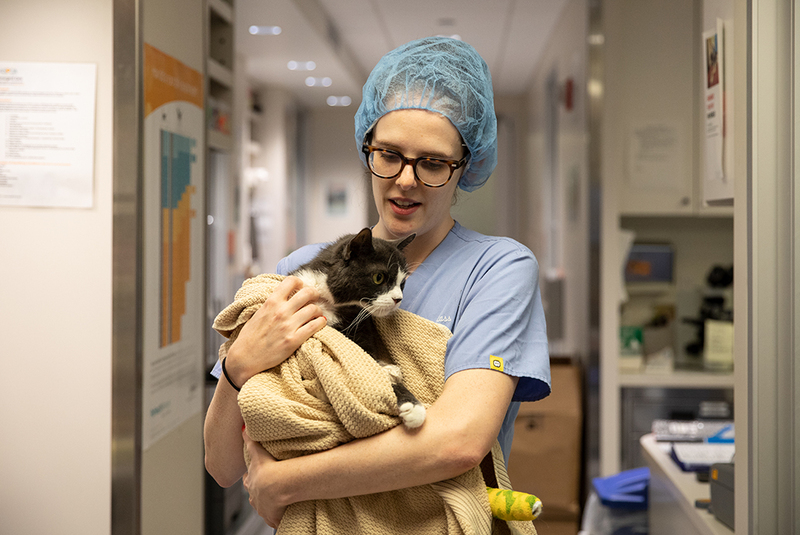 The carrier was left at the front entrance of the ASPCA Adoption Center and hospital in Manhattan in late August 2018. 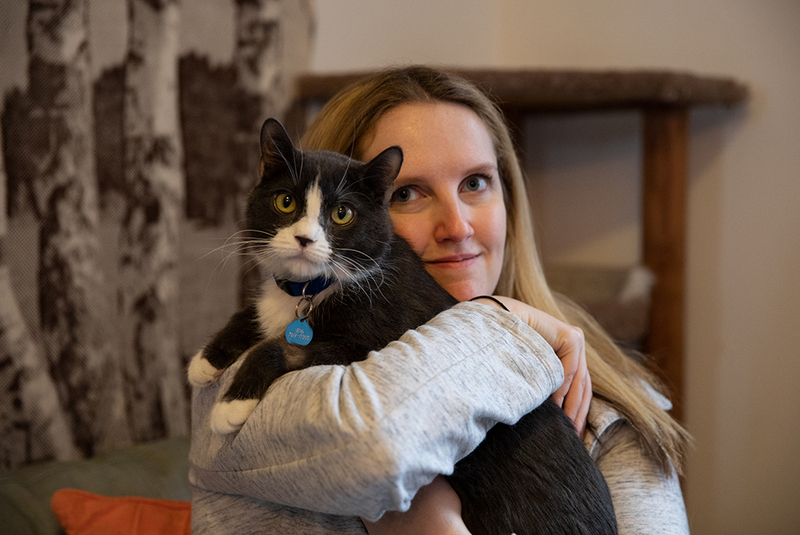 Inside was a calm, six-year-old, gray-and-white male cat. Security video showed an unidentifiable person leaving the carrier at the doorstep. 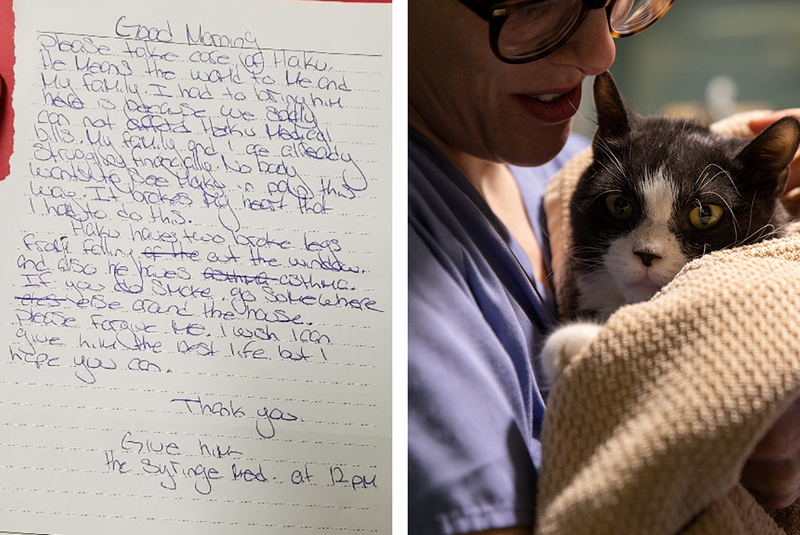 With no owner information, the hospital’s Manager of Client Services, Jessie Pizanias, admitted Haku as a stray so he could receive immediate medical attention. After he was admitted to AAH, veterinarian Dr. Daniela Gilbert conducted Haku’s initial exam. “He suffered a lot of facial trauma,” she recalls. “His jaw was markedly swollen, he had dried blood on his front paws, he was reluctant to bear weight on his left hind leg and unable to bear weight on his right front leg." “These were classic high-rise injuries,” explains Dr. Gilbert, who stabilized Haku and provided him with oxygen, hydration and pain medication. High-rise injuries occur when an animal falls from a high window, or fire escape and are often seen in animals who live in urban environments where tall apartment buildings are common. X-rays confirmed that two of his legs were broken, while thoracic radiographs (imaging of the chest) verified his asthma. 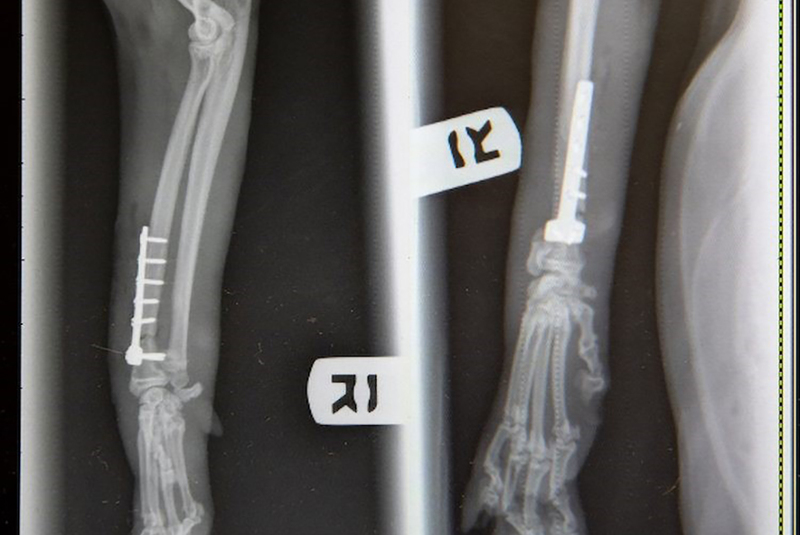 X-Rays show how Haku’s broken limbs were repaired. He also suffered from a jaw fracture and a split palate. Haku was unable to eat because of his jaw injuries, so a feeding tube was then placed in his neck. “After stabilizing him, we came up with a plan for the multiple procedures he would need,” recalls Dr. Gilbert. “I knew he would be a big project—he was just so broken,” adds Dr. Melanie Glass, an AAH veterinarian who noticed Haku in the hospital’s intensive care unit. Dr. J’Mai Gayle, Director of Surgery at AAH, repaired Haku’s right front fractured leg and applied stints to the other leg. Despite enduring several procedures, Haku remained tranquil. Haku gets a bandage change. As Dr. Glass told us, not all cats who fall from high distances fare as well as Haku. 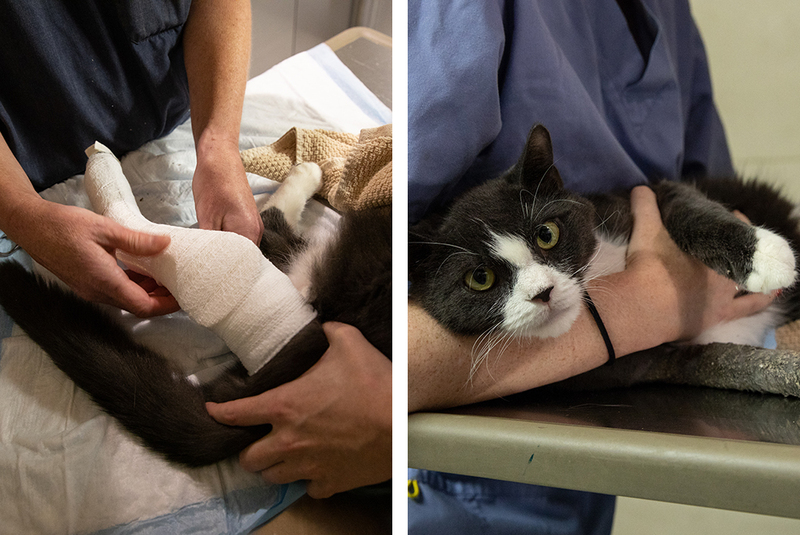 While this tragedy— called high-rise syndrome—is completely preventable, the ASPCA saw 75 cases in 2018 alone. The ASPCA urges people to install snug and sturdy screens in all their windows, even those with childproof window guards, because cats and small dogs can easily slip through the bars. Haku’s recovery took time. His front leg was splinted for five weeks and his hind leg for eight. After two weeks, his feeding tube was removed and he was able to eat again on his own. Haku was very cooperative through bandage and splint changes, and as he started feeling better, he began to come out of his shell. To help Haku recover, Dr. Glass took him home as a foster. 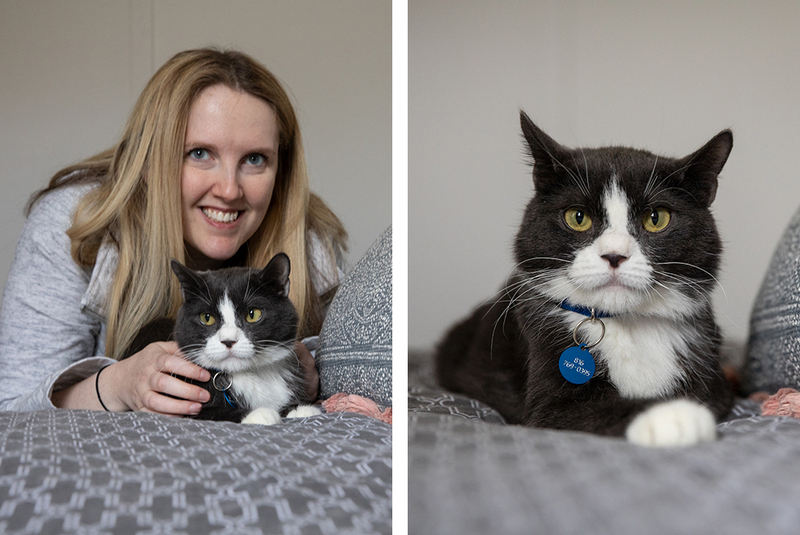 One weekend, Dr. Felicia Magnaterra, an Adoption Center veterinarian, was cat-sitting Haku and witnessed him suffer an asthma attack. After their return, Dr. Magnaterra administered a course of oral steroids. Within two days, Haku’s asthma was under control. Dr. Glass was so taken by Haku that she called her sister Allison, a physician in Sacramento, California, hoping to make a match. After spending the Christmas holidays in New York, Allison flew home with Haku just before the New Year. Dr. Allison Glass and Haku. “He was excellent on the plane; I was actually surprised by how easy it was,” says Allison, whose two other cats, an orange tabby named O.J. and a brown tabby named BonBon, welcomed Haku into their home. Haku is now far from his tragic past.